One of the five largest races in the country, the 15-mile Buffalo Bayou Partnership Regatta travels from West Houston to Allen’s Landing in Downtown Houston. The longstanding Houston tradition is open to all ages, starting at 12 years old. The race begins at 7700 San Felipe Street (west of Voss) in West Houston, and finishes at Allen’s Landing in Downtown. The free afterparty will happen at Allen’s Landing. Sign up your business, office or corporate team to be a Team Sponsor. 2018 Team Sponsorship opportunities range from $400 to $10,000. Download the form to view the many benefits of participating. 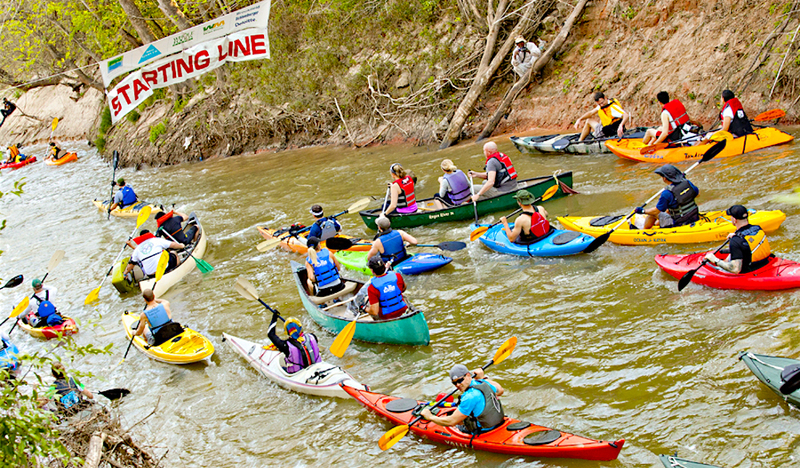 Paddlers’ friends and loved ones, along with other spectators, are invited to cheeronthe paddlersalong Buffalo Bayou. The race ends with a free party at Allen’s Landing in Downtown, where visitors can inspect the colorful boats up-close and enjoy live zydeco music and more. Food and drink will be available for purchase. There will be an awards ceremony at 1pm, before the party wraps up at 2pm. Registration is $50 per paddler through Saturday, February 23, 2019. After that, it’s $55; $60 same-day registration. $25 with valid student or military ID (email ID to [email protected]) and $10 for members of BBP’s young professional group, The Currents.